Congratulations this morning go out to FC Barcelona, winners of the fifth and final game in the Liga Endesa championship, 73-69, over Real Madrid. In yet another cliffhanger, Los Blancos “died with their boots on” as the official league writeup would have it, while the Blaugrana were led by Pete Mickeal (17 points, nine rebounds, 23 performance index rating), Frán Vazquez (16 points, eight boards, four blocked shots) and prospective San Antonio Spur/series MVP Erazem Lorbek (10 points, six rebounds). Highlights and extrapolated game report follow. Barcelona showed the heart of a champion in overcoming the hefty blow of a game three defeat to win two straight and take the 2011-12 Liga Endesa title. Because they know to win. Because from the lucky triple from ten meters out in the last second of game one to lifting the cup were many moments, many emotions, many formulas. In short, this was an unpredictable series of multiple unexpected changes and variants. And Barca played with them all. Boniface Ndong, wearing a knee brace, warmed with the rest of his teammates. Ndong was expected to be an extra body for a depleted Barcelona rotation, but ended up playing just three minutes. 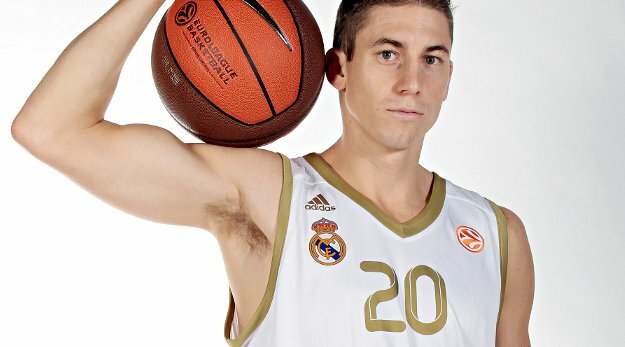 On the other hand, the Real Madrid starting lineup was revolutionized with the ushering in of eternal alternate Jaycee Carroll and Nikola Mirotic, who would be tasked with stopping Lorbek. And in fact Lorbek’s triple represented the first points of the game after a shaky start from both teams. When Juan Carlos Navarro connected for another three to make it 6-0, 1:37 had already elapsed. From early on, Real played a quick game, forcing transitions as fast as possible. Carroll ran plays focused on cutting to the baseline to get open. Additionally, Madrid’s first two baskets came after offensive rebounds – once again topping Barcelona off the glass was a bad sign. Expectations and fear seemed to mark the early stages of the match before Joe Ingles and Martynas Pocius traded buckets before a little action from two players who hadn’t lived up to expectations in the series: C.J. Wallace nailed a three and thereafter Chuck Eidson put in an outside two. The reemergence of this pair (especially Eidson, who played a total of 0:04 seconds in game four) was the best news for a Barça side suffering from Navarro’s foul trouble and the harassment of Lorbek. Throughout the first 10 minutes, Real Madrid had its greatest difficulties in driving to the hoop in the half-court offense. After going to Sergio Llull to fill this gap, he was quickly neutralized by Vazquez. The first quarter ended 16-12 with the undeniable feeling that Barça was looking much more comfortable – not to mention having put seven players on the scoreboard already. Barcelona extended the lead to 24-16 with a combined eight points out of Ingles and Victor Sada. With the Blaugrana D focused on Carroll, the Madrid attack had become feeble until an 8-0 run triggered by a kickout to Carroll, followed by Mirotic’s out-dueling of Lorbek and Sergio Rodriguez’ and-one capping a fast break. In defiance of the “29 Rule” this series had seen to this point, Carroll hit on a three to make it a 30-26 Real advantage after a 14-2 run. It would be the last lead Madrid held. Behind Felipe Reyes, Navarro and Vazquez, Barcelona capped the quarter with a 13-4 streak of its own to enter halftime up, 39-34. A game of catchup characterized the third quarter, with Barcelona rapidly increasing the lead to nine points at 43-34 and drawing five fouls on the Madridistas in just over two minutes of play. Kyle Singler and Llull brought Real back to just one point down at 46-45, but Mickeal and Marcelinho Huertas reraised the lead back to 54-45. On defense, Barça’s 2-3 zone reduced Madrid’s offense to a series of outside shots and ineffective isolation plays. In an attempt to put the breaks on the Barcelona offense, Madrid came out for the fourth in a 1-3-1 zone for a nice 6-0 run, but Lorbek hit four consecutive points after finally shaking off Mirotic. When Lorbek hit his fifth and sixth points in the quarter, Barça led, 62-56, and was feeling it. Of course, so was Carroll. Still the go-to guy (he’d end up with 16 points on 6-of-13 overall shooting, the only Madrid player aside from Llull to get more than nine chances), Carroll first hit a 20-footer to make it 64-62 with little time to play. Mickeal and Lorbek would put it back to 68-62 only to see Carroll jack up another three for a 68-65 line. After a pair of Mickeal FTs, this time it was Singler refusing to let Madrid die with a long three to make it 71-68. But with seconds remaining and the run of intentional fouls on, time had run out on Real. Barcelona and Xavi Pascual defended their title, bringing home the third Spanish championship in four years.